If there is one Narlie that the novice Rock Lord collector will want, it is Narliphant. Not for the delightful lilac and purple hues, but because of his (her? its?) starring role in the movie 'Gobots: Battle of the Rock Lords' where it played the part of Scooter's love interest. It is Narli-phant that must hoist all of Narlie culture onto his/her/its shoulders and fly the flag for Narli-kind! Unfortunately, show accuracy is not Narli-phant's strong point, which makes you wonder if there was a different coloured prototype, or why they changed it in the first place. 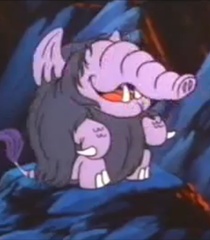 Cartoon Narli-phant has a lilac body and dark purple hair, whereas the toy Narli-phant has a dark purple body, lilac snout and greyish white fur. The same colours are there, just mixed about. Granted, the toy colour scheme has more contrast (if still being basically all shades of the same colour), but it's still an odd decision not to make the two match. Narli-phant's moving parts are a snout and tail, both cast in lilac plastic. As Narli-phant rolls along, they both bob up and down and (sort of) make a noise. The entire mechanism is made from plastic wheels and pulley, and combined with moving parts fixed in fur means it's a bit stiff if the wheels don't have the right amount of grip on the surface. Narli-phant's name hints that it is some sort of elephant, though the trunk looks a lot more snoutish, and while it has ears, they're not particularly large. Its back legs are definitely elephant legs, but the front are weird claw-things. All the Narliphants I've found have had fur that's a bit more dense and matted than the other Narlies. I don't know if that is down to different construction (I'd assume it's all the same type of fur used) or whether Narliphants are just more loved by their owners. I'm not sure if I could love Narliphant as it looks rather ugly, but perhaps I am a monster, unable to understand true love like Scooter does. Narliphant is overall quite uninspiring. With the similar colours and ugly appearance, it's probably the least visually interesting of all the Narlies, but on the flip side, it does have a starring role in the movie, making it a must for even the smallest Rock Lord collection.